Well, I bought something I thought I'd never own. If you don't already know, I love CB's. Particularly, the twin cam F's. I'm pretty sure owning a CBX will never be in the cards for me, but I'm extremely happy to have picked up one of the ''Big CB's". SO happy. This ''build'' will be a long way off,but I just had to share. I know this is old,unimpressive technology,but I just love the second generation F's. And I'm happy. I'm not crazy about the anti-dive forks,but I don't really have any plans for suspension swaps for this bike. I thought about a full front and rear swap to F3 bits and 6 spoke 17's, but I'm not sold on the idea yet. Especially regarding going monoshock. I just dig what these bikes are as-is. I'll source some proper shocks for out back,of course. It has superbike bars on it now. I'm gonna keep my eyes out for a set of the original adjustable bars that should be on here. (Wish me luck. ) I really only plan to put this thing back like it should be. New rubber bits throughout, chain and sprockets and a repaint to all of it's dated original glory. Like I said,this is a long way from getting put back together...and that's killing me! I know if I crammed I could probably have this thing rockin' before this riding season is gone, but I need to get rid of some other projects first. Still,I'm happy. Im in this bike cheap,too. Fresh tires and chain/sprockets will cost more than I paid for it. Did I mention I'm happy? I am happy. Awesome bike one day I want build a cb or zrx like that. These people High Fived 94yzf75fighter! Happy to hear you are happy!! .Not really a Honda guy but like the older CBs.Good to see another bike get resurrected . These people High Fived Suban12! Hey bro, are u happy? These people High Fived DrJellyFingers! Very happy Found a set of original bars on eBay and I'm winning with a $19 bid. look at those tiny little rotors and calipers on the front. That is an awesome score, I wish I would have kept mine! Just wondering, have you ridden a 1100F? Stock vs stock, the CBX will be left for dead by one in any drag race I can imagine as the CBX clutch will not tolerate the abuse the 1100F will. At 110hp and 70lbft stock the 1100's are one of the meanest machines I've ever seen from the era too. Totally under rated and far beyond overlooked by most. Stuff that 1100 engine into a 750F frame and scare the hell out of every sportbike you come across. These people High Fived RatFighter! Great score, I love the 80's bikes. You came out like a bandit on that. But I'm sure you know what those 1100's are worth. These people High Fived Mista M! Rat, you said it best. That's exactly how I feel about this bike. No, I've never ridden one, but I'm definitely looking forward to it. MistaM, thanks. And yeah, I got lucky. The guy has another one for sale. I'm trying hard not to buy its twin. I'm supposed to be building a house. If you can get it cheap and its all there. Buy it and flip. Those things go for stupid prices in original shape. 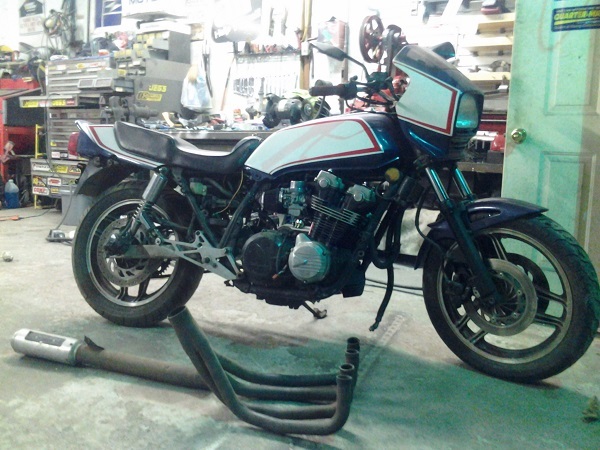 Thank you for viewing CB1100F- Poor man's CBX in the Member Project Bikes section of our streetfighter motorcycle forum. I hope you found it useful!